My 7 year old granddaughter was very excited to get her book box. She could not decide which one to read first. The books were the appropriate reading level for her. We're happy to hear that Jacqueline. We can't wait to select 4 more amazing books for next month's box! I purchased this subscription for my 10 year old daughter who likes adventure and wizards/magic. The first box was good, but we expected more Harry Potter type books, so I gave them the feedback and they were very responsive. 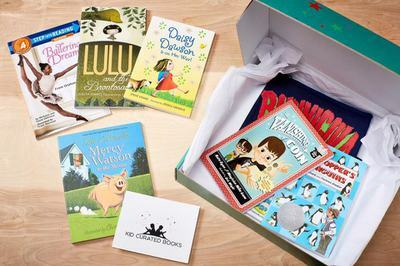 I look forward to receiving the next box and seeing how much my daughter loves the next round of books! David - We appreciate your feedback. That is how we are able to tailor each box even closer to your daughter's interests. We've picked out some great, magical books for her second box and can't wait to send it off to you next week. Keep the feedback coming!